Have you ever wondered what movie fans talked about back in the Roaring Twenties? I sure have, and it’s an absolute thrill to see that old movie magazines give us some glimpses. If you think about it, sending in letters to these publications in the hopes that they would end up in print was, I’d assume, pretty exciting. Sure, fans would’ve discussed movies with friends and family, but there was nothing like today’s Internet communities. Magazines provided a forum for fans across the country to weigh in on vastly important matters, such as why that one actor is magnificent and why that one actress’s hairstyle was awful. …I would like to know, Mr. Editor, why the following incident happens so many times. The heroine is pouring coffee and sees the hero for the first time. She forgets what she is doing, and allows the coffee to run over the cup and fall on the table. I may not have made this very clear, but I think you will understand what I mean. The latest case of this hackneyed incident, to the best of my knowledge, occurs in “The Hushed Hour,” where Mary Anderson and Milton Sills look into one another’s eyes and Mary spills the coffee. I think Motion Picture Magazine is a delightful book to read, but I really do wish the divorces of the different screen stars would not be published in it. We readers want to read about the different pictures and the stars themselves, not about their divorces. That is absolutely tiresome. There seen to be so few in Filmland who are not divorced or divorced and re-married that a divorce is no more news than the announcement that dinner is served. Dear Editor: Conway Tearle is no longer one of my idols. Perhaps I would like him better if he had his face lifted. Dear Editor: Now there is Leatrice Joy–one could not call her beautiful, perhaps, but she certainly is delightful to watch on the screen, where her winning personality captivates her audience from the start. Now, I’m single and I don’t intend to get into trouble right away by taking unto myself a wife to battle with the rest of my days. But when I do lead a blushing bride away from the altar, she’s going to be the sort of woman I believe Leatrice Joy to be. I do enjoy good pictures and I do pass the good word along when I see a Charles Ray picture, but why let another good man go wrong in that toggery and clutter that C. R. wears in the picture “Paris Green”? It’s all wrong. Why didn’t they call in some doughboy who was over there, and who had a chance to get acquainted with hobnails and all the rest of the things. H would surely have been able to make some worthwhile corrections which would have made things more soothing to the nerves of the observers who were also “over there” and had the opportunity of getting into a pair of hobnails and under a pack. And you know how every time the Oscars are on people complain about the “boring” award categories for editing, sound mixing, etc., even though those are massively important jobs? And how end credits are just something that plays in the background while you put on your coat and fish around for that bag of Skittles you dropped earlier? Dear Editor: There have been so many complaints concerning the “wasting” of film space in printing the names of directors, cameramen, etc., that I cannot resist putting in my oar and pulling the other way. Sincerely, Mildred E. Hay, Lancaster, Ohio. Dear Editor: I read your article in the current issue of your magazine, “Moral Housecleaning in Hollywood,” and, while I did not agree with you, never thought of writing you one woman’s view. Yesterday I read an item in a photoplay magazine in which it stated that two more stars in the Hollywood firmament have BOBBED THEIR HAIR. Now, these women must be sadly lacking in imagination, if they think their beauty or picturesque value is being enhanced by their hair-bobbing. In a sense these women belong to the public, and it is not conventional and is an offense against the traditions of this country and good taste for an American girl to wear her hair like an Igorrote. …The women and the men, too, of the screen are held up to the youth of this country every day, and when they see Constance Talmadge get by with bobbed hair and a divorce after she has been married scarcely a year, they feel, “If she can do it, why cannot I?” You see how far-reaching and insidious is the influence. Then, too, Gloria Swanson, that much-lauded and beautiful woman, is now considering her third venture, but I have not as yet relegated her to anathema, and will not until she, too, shears her tresses. What is the matter with Ramon? Novarro is certainly a bashful man. I cant see how he ever got in pictures, unless it was for his looks, for he certainly acts as if he is afraid of women. If he was as full of pep as Jack Gilbert, he would be just as popular. He has the looks and the training, but he doesn’t use it. Oh, Novarro was my best bet, but I think Jack Gilbert is going to lead them all in being popular. I would love to see Novarro in one play like the “Sheik,” just to see if he would go to sleep on the job. Kathyleen White, Los Angeles, CA. Dear Editor: Isn’t there something you can do to rid us of the Valentino imitators? They are becoming an awful bore to say the least. In the first place the very fact that they are willing to be groomed to take his place proves them incompetent; if they had any ingenuity at all they would create a vogue of their own and not try to shine by his reflected glory…. To begin with, few are so capable as Rudolph Valentino, and from general observation I should say that he can handle more work–turn out better work–and earn larger dividends on the capital invested than any other star in his profession; therefore it would seem that he is worth conceding a few favors to. Don’t let’s lose the greatest artist we have on the screen today just because of a broken contract and a lot of silly legislation. Some laws are stupid and meant to be broken; why not break this one for the good of the public–or at least for the amusement of the public? And if Famous Players-Lasky Corporation is incapable of treating him fairly, why don’t they release him and let some other company sign him up? Anything so that we may have our brilliant and lovable Julio and our courageous and gallant Gallardo back again. And hey, you know that one guy in the forums who’s always talking about obscure masterpieces only he and four other living people in the world has seen and who complains if he doesn‘t think discussions are being serious enough? The Twenties had that guy too! Dear Editor: Reading your excellent journal, which, by the way, is about three times its ilk over here, I am always rather puzzled by the purport of most of the Letters to the Editor. They all seem concerned only with the star, the whole star and nothing but the star, whereas, we, over here, are inclined to criticize films from an entirely different angle. Here we take into consideration the highest artistic viewpoint, we appreciate the exquisite settings, the light and shade which follow nature’s changes; the small-part actor who really lives his part and the subtle suggestion which saves many feet of film, as Chaplin used in his Women of Paris. These are the things we English people praise or blame in our Letters to the Editor. Stars who only pose throughout the piece, precocious children who have no counterpart in real life–these we rate at a discount. But players who sacrifice vanity and personality to the part, we praise with the highest praise and admiration. Three players who do this thing are Lewis Stone, Bessie Love and Frankie Lee. Maybe I am an out-and-out highbrow. Maybe I have happened to read a lot of mirepresentative letters from your “fans” But, in any case, these are my sentiments. I want some of the fans to know what I think of them. What’s the idea of razzing little Alice White? I have just opened Picture Play, and there, staring at me, is Crocella Mullen’s tirade against Alice. I’d like to know why they’re always tossing razzberries at her. Gee! I think she’s nice. I was just about to give up finding any nice comment about Alice when I spied Betty Harrison’s note. I want Alice to know that I’m for her, and I’m glad to know I’m not the only one anxious to defend her. The first motion picture I ever saw was a nameless comedy thrown on the side of a brick building. The operator stood in a delivery wagon on the opposite side and flashed the picture across the street. The stunt, which was an innovation in the little town where I then lived, was put on to advertise a new brand of shoes! The man who operated the picture machine was dressed in the garb of George Washington, and his wife was on display all day in the store, wearing a gown which, ‘twas said, cost the fabulous sum of one hundred dollars! One of my earliest recollections is that of Francis Ford and Grace Cunnard playing in a serial of many installments, “Lucille Love.” A movie ticket in those days cost a “jitney,” and the town’s worst tenor rose in the middle of the program and sang an illustrated song about a soldier boy marching off to war! This was in the days when all moving pictures had to move, and almost the entire picture was taken up by the fast and furious action of a tramp chasing two mischievous boys, and a flat-foot constable chasing the tramp! The whole town was stirred when announcement was made that a three-reel feature film would be shown Saturday night! Times have changed since then, eh? From all these letters, one thing is clear–people back then loved their movies. They discussed them just as passionately and thoughtfully as they do now. Perhaps even more so–today, the entertainment industry has turned into a vast, dizzying conglomeration of choices for every possible niche interest. Back then, what the theater showed was what you saw. What the theater showed was what you all had in common. I count these artists as dear friends who have helped me over many a weary hour. The world gives plenty of hard knocks without the worry of these paltry ones. Just remember that the stars, even if not your favorites, brightened up an hour when the world seemed none too kind, and gave you a merry laugh when laughs were few and far between. Note: You can read old letters and articles for yourself by going to the Lantern website–a priceless resource for anyone interested in film history. This entry was posted in History and tagged fan magazines by Lea S.. Bookmark the permalink. This is a great blog, congrats! Keep researching! Very nice. Hey everybody! I’m in the midst of some diligent research for a post scheduled for this weekend, so this is a repost of an early, little-viewed article of mine that I really loved. Reposts aren’t something I ever plan on doing maybe more than once a year–but I can’t resist with this one. Everything the research turned up was just too priceless. If you’ve ever wondered how movie audiences talked about their favorites stars and films back then, look no farther than their very real letters to vintage movie magazines. They are chock-full of priceless thoughts, observations, and even rants from passionate film fans who probably knew your very own grandparents and great-grandparents. Enjoy! 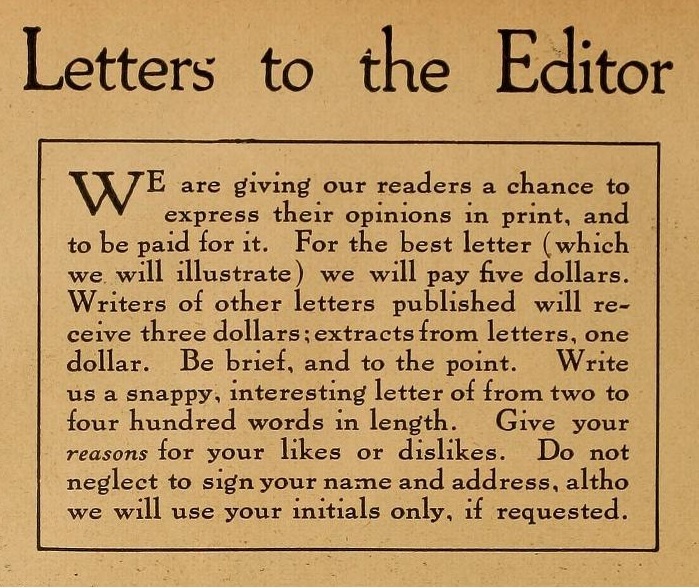 I agree–old fan magazine letters are fantastic! Last year I was reading a lot of old fan letters to try to trace the rise and fall of Jackie Coogan’s popularity from around 1921-1925, and some of the letters were just amazing. Early on, people fretted that success would spoil him and that his parents were exploiting him. Later, as people wearied of how much Jackie was hyped, there were letters with choice bits like this: “Jackie is a clever and talented youngster, but the press agent bunk about his precocity and perfection almost spoils him.” Other made pointed reference to the fact that Jackie was hitting an awkward, less photogenic age. One I remember in particular said something like, “My fervent wish is that Jackie Coogan would retire for five years and leave us with the memory of how he looks now.” Uh, ouch. I also love sections like “What the Picture Did for Me” in Exhibitors Herald, where theater owners cut through the marketing hype and give their unvarnished opinions about the real value of various movies. So good! They’re marvelous! And such a great research tool, too. People sometimes knock fan magazines as being too fluffy or being supposedly full of fake stories–maybe you see a few stories that seem suspect, or see an actor described in a way that could probably be chalked up to studio publicity, but the mags could be a lot more hard-hitting than people realize. You know, today we sometimes assume that people back then were more naive when it came to what entertained them. But good grief, in all those letters you can see that they discussed films the same way we do now (maybe with a bit more thoughtfulness or romanticism). They even had much slower, snail mail versions of Internet forum arguments. In one magazine I saw a letter make some mean comments about Connie and Norma Talmadge (if I remember rightly). 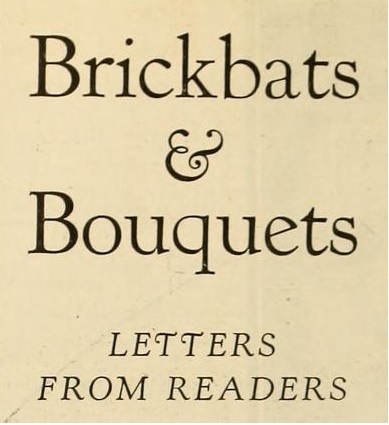 In the next issue was a spirited letter defending the Talmadges, and in the next I think there was a couple more. It was just great. I’ll have to see if I can find those again. In Motion Picture Story Magazine, it was so much fun to follow the Popular Players contest of 1912. The praise for each player by the fans was a great eye opener to which actor was the favorite. I found myself getting super excited to see how many votes each player had as the contest went along. The contest was even extended a few months! Finally, when it was ended in June 1912, the winner was Maurice Costello. I assumed “Miss Joyce” that was mentioned in one of the letters you reprinted here is Alice Joyce, a very favorite of Motion Picture Story readers. Many people talk about how great she was. Yes, it was probably Alice Joyce! Oh, I love those old popularity contests too, it’s fascinating to see what forgotten names were once wildly popular…and which famous actors were beloved back then, too! One fan magazine contest in the early ’20s had different categories for all kinds of actors (comedians, best-looking, dramatic actresses, etc.) and I was excited to see that Buster Keaton was second to Charlie Chaplin (and Charlie had a healthy lead, of course, but still). I love that you’ve read through Motion Picture Story Magazine, isn’t it just full of treasures? It really is! I even read all the advertisements in the back. I think it’s important to learn about and breathe the names of forgotten actors; they were important to people at one time, and I believe it keeps them alive in spirit. 🙂 oh and do I LOVE the interviews. Even the actors/actresses that I will never have the chance to watch act. Ok this is getting long, I get so overexcited! I know you understand!